Dad's BBQ - a slightly secret recipe, but I can tell you that 7-Up was used in the marinade! :o) Now that I realize it. I don't have a BBQ recipe on this blog! Must get on that! My sister recently turned me on to raw oats (rolled, whole wheat, bran) As much as I love cooked oatmeal, I have to say I'm ADDICTED to raw oats. I eat it like a cereal with some milk and fruits. I sometimes add honey and sugar if I want some sweetness. -Chicken Makhani / "Butter Chicken"
Pesto Chicken Pasta. Need I say more? :o) I used regular peanuts this time and it was delightful! 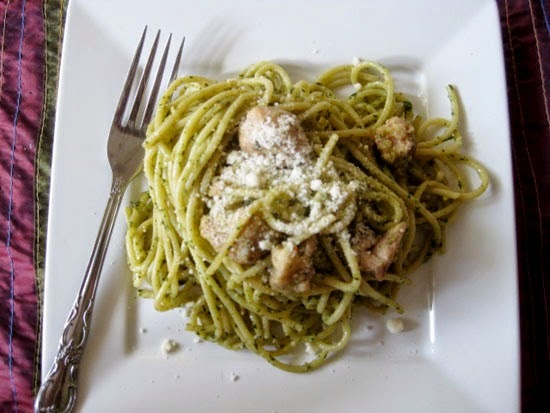 I love making pesto and experimenting with different nuts. I've since tried this with hazelnuts and spanish nuts (which I still have yet to post up! ).